1. Drill Team practices are held every Monday night at the Pembroke Armoury from 1830-2030hrs unless otherwise stated. 2. 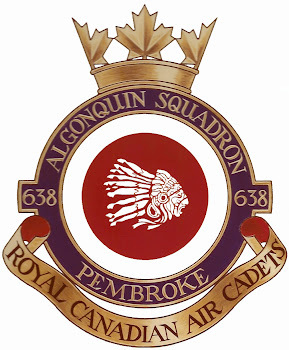 Ground School will take place at the Pembroke Armoury on Tuesday evenings from 1845-2100hrs in the computer lab and Wednesday evenings from 1800-1830hrs in the Ante Room. 3. Cadets who wish to participate in an air rifle range practice and try out for the Squadron’s Marksmanship Team are encouraged to come out to the Armoury Thursday evenings. Range will be held every Thursday night from 1800hrs to 2100hrs unless otherwise stated. 4. Cadets interested in being part of the combined Army Cadet/Air Cadet Brass and Reed band are encouraged to come out to the Armoury Thursday evenings from 1800hrs to 2100hrs unless otherwise stated. No experience is necessary and instruments are provided if needed. If you have your own instrument you are asked to bring it with you. 5 . There will be a Biathlon shooting practice held this Saturday, November 15th. The senior cadets will be shooting from 1100 - 1300 hrs. Juniors will shoot from 1300 - 1500 hrs. The practice will be held at Ottawa River Sportsman’s club, 770 Beachburg Rd., Beachburg. 6. New security procedures have been instituted at the Pembroke Armoury. All outside doors will now remain locked at all times. A member of the Squadron staff will be posted at or near the door to let people in. If you get to the Armoury and no one is at the entrance to let you in please ring the doorbell located at the right of the door. 8. Applications for National Summer Training Courses are now being accepted for Summer 2015. So far we have the following cadets working on their applications: Fleurant - Power Pilot, Martin - international Exchange, Hill - Glider Pilot, Frampton - Airport Operations, Rochat - Power Pilot, Fleming - Glider Pilot, Croft - Airport Operations, Keetch - Air Maintenance. To get an application package please see the Administration Officer (2Lt Wendy McGinley). The deadline for complete packages is Wednesday, November 26, 2014. Don’t wait until the last minute to apply. 9. Don’t forget to sign out your lottery cadet tickets. Sold books are due back by Wednesday, December 10, 2014. 10. The Squadron’s Sponsoring Committee sent home Sunset Gourmet fundraising packages this evening. 40% of all sales get donated back to the Squadron. Order are due back on November 26th. If you have not picked up the package, please do so from either Amanda John or Aimme Hodder.